I cooked this dish for my mom, dad, and sister in San Francisco last July using the bountiful fresh seafood of the Pacific - scallops, shrimp, and halibut. I knew my dad would love it but was worried about my mom and sister, since neither of them are the biggest seafood fans. To my surprise they all loved this dish, especially the Thai style broth. So I knew this recipe was a keeper! Previously, I had used toasted French bread for this dish, but I felt this was a stretch too far. As I know well from my recent travels, while French bread is regularly used in Vietnamese, Lao, and Cambodian cuisine, it is not to be found in Thailand. Plus, the idea of using rice noodles or plain steamed rice didn't appeal to me, as they would be too soft and mushy. I felt like I needed to add texture to this broth-based seafood dish. So I decided to take some steamed rice, create patties, and brown them in a skillet. Frying the rice patties creates a nutty flavor, crisp texture, and contrast when placed in the broth. I am now in love with this technique and think that the crispy rice cake will be a regular feature in many of my Asian dishes, especially soups and curries! In a sauce pan start the broth by combining the coconut milk, Sriracha, lemongrass, ginger, serrano, fish sauce, soy sauce, sesame oil, sugar, curry powder and rice wine vinegar. Simmer on low heat for 10-30 minutes to meld all the flavors together. Rinse the rice under tap water. Japanese short-grain sushi rice is very sticky, so it is important to rinse the excess starch off the kernels. Once the rinse water runs clear place the rice, water, rice wine vinegar, and salt into a pot and bring to a boil. Once the rice is at a boil reduce to a simmer and cook for 15-20 minutes or until the water is absorbed and the grains of rice are tender. Remove the rice from the pot and allow it to cool on a plate. Once the rice has cooled it is time to make the crispy rice cakes. Form the rice into patties with wet hands, which helps to keep the it from sticking to your fingers. Heat a nonstick skillet on medium high with vegetable oil, and cook the rice cakes until lightly golden on each side, about 5-6 minutes per side. Remove and set aside. 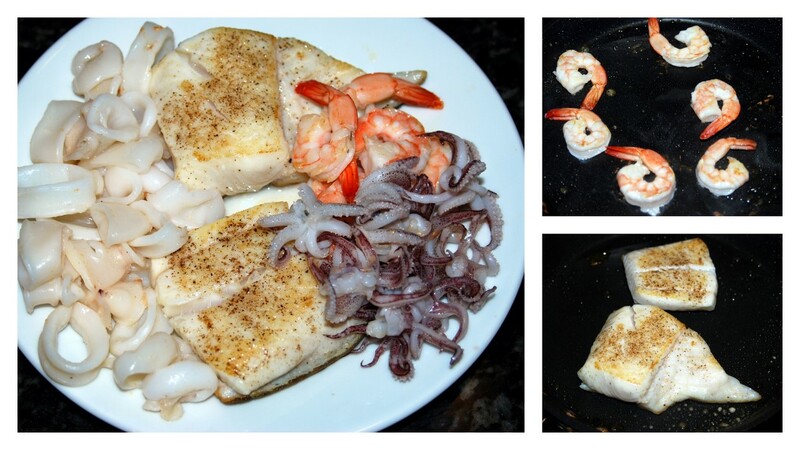 Cook each kind of seafood separately using the nonstick skillet over medium-high heat. Season with salt and pepper just before cooking, and use a third of the vegetable oil for each batch. Slightly undercook the seafood, since it will be going into hot broth and will continue to cook all the way to the table. The shrimp should each be cooked only until the outside has all changed color to orange, about 30-45 seconds per side. The squid will be ready once the tentacles curl up - just 1-2 minutes total. Both of these cook very quickly, and will become rubbery if overcooked. For the halibut, place it skin side down and cook until golden brown, about 3-4 minutes, then turn over and continue cooking until opaque in the center, another 2-4 minutes. 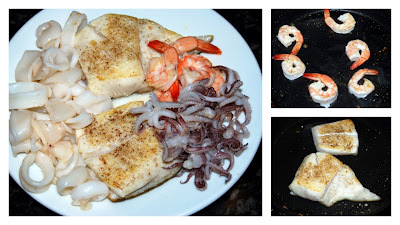 To plate, place the rice cake in a bowl with halibut on top and surrounded by the shrimp and squid. Carefully pour the hot broth over everything and garnish with cilantro, scallion, basil, and drops of toasted sesame oil. Happy eating! What a delicious dish. I like sea food a lot and this recipe includes 'everything'!!! This looks so fresh and delicious! I love all the sea food too! I love you Thai recipe and so did my wife. Thanks.